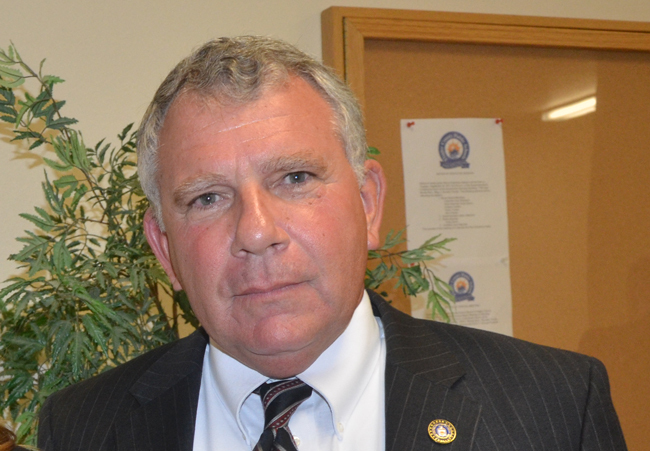 Barely two months into his tenure as Bunnell’s city attorney, Lonnie Groot has resigned. “The purpose of this communication is to advise you that I am ending my tenure in the position of City Attorney effective the end of September,” he wrote the Bunnell City Commission on Saturday. Groot gave no explanation for his resignation. But it comes less than three days after a city budget workshop at which Commissioner Jenny Crain-Brady openly criticized Groot’s billing, then went as far as to say that she didn’t want to “head into a situation where the attorney is telling us how to run our day-to-day operation”—the sort of statement any city attorney could easily take as an offense. Monday afternoon, Crain-Brady said she wasn’t aware Groot had resigned–it was still the Labor Day weekend when officials don’t necessarily check their email–but she defended the questioning that had taken place last week, particularly since the questions dealt with serious financial matters. “I have a right to make those comments, when those bills come in at that level and our budget is what it is,” Crain-Brady said, noting that the city was in the midst of advertising for an $80,000-a-year city manager–what would be $20,000 less than legal bills that could approach or exceed $100,000. “Those comments were in line,” the commissioner said. The but of the second clause was telling. But again, Crain-Brady, after hearing Groot’s words from the email, said the hard questions had to be asked, and that it was up to her to ask them. “It’s a hard position to be in and I’m not enjoying it one bit,” she said. She wasn’t questioning the legitimacy of the bills, she stressed, especially as she recognized that going from one lawyer to another, some overlap was inevitable. Nevertheless, she said, the billing raised difficult questions. “I’m sure he’s an excellent lawyer, I don’t know that we could have afforded him,” Crain-Brady said. In mid-August, Groot’s Lake Mary-based law firm, Stenstrom, McIntosh, Colbert and Wingham, submitted an invoice for $24,000 for billable hours during July, or more than a third of the city’s annual budget for legal services. Groot explained at the time, to little opposition from any of the commissioners, that the city faced a series of critical issues and cases that needed sustained attention. Among those: the purchase of the Plantation Bay utility with the county (which has rung up its own share of legal expenses in that regard), the Palm Terrace mobile home community case over water issues, a lawsuit from Waste Pro, the garbage hauler, disputing Bunnell’s contract with the school board to haul its garbage, and other, lesser issues. Consultations with commissioners and city staff also totaled $7,400. Crain-Brady took issue with that as well. Because of the number of issues on the attorney’s plate, the resignation puts the city in a difficult position, and one made more so by the commission’s openly splintered and uncooperative relationships. Groot’s resignation is the latest collateral damage of an ongoing battle between the new majority on the board, represented by Elbert Tucker, John Rogers and Bill Baxley, and the former majority, now a minority of two, represented by Mayor Catherine Robinson and Crain-Brady. The latter two had opposed hiring Groot two years ago, when the city entered into a new contract for legal services. Robinson and Crain-Brady stuck with Sid Nowell. A few months after Baxley replaced Daisy Henry as a commissioner, Nowell announced his resignation. The new majority saw its opening to hire its own choice. Groot was brought on. Along the way, the new majority fired Armando Martinez, the city manager since 2007, giving him the option to stay until his contract runs out in October. Both he and a majority of commissioners, while agreeing to re-negotiate his contract, could not agree on terms. Soon after firing Martinez, Cynthia Bertha, the city’s finance director, resigned, openly blaming the new majority for her decision, though Bertha is back as a finance consultant for the city. In his resignation letter, Groot only outlined what legal matters the city is facing currently, including the Palm Terrace trial scheduled for October, and what he and his firm will do to carry through those matters to the extent possible. His resignation is not effective until the end of September. “We trust that all other litigation remaining and non-litigation related matters can be smoothly transferred to new legal counsel in the course of an orderly transition at the time of the conclusion of our services being provided to the City,” Groot wrote. No comment except they need to hire a Flagler County Attorney !!! A Flagler County attorney would be good, but with all that Bunnell has on its plate, the attorney will need good backup, both attorneys and staff, to do the job. Good backup will be critical. The Commission had a requirement in the RFP (and I believe rightly so) that the attorney be Board Certified in municipal government law. The Groot firm was the only firm responding to that RFP. They may have to drop that requirement and settle for a lesser qualified attorney. Or have reasonable expectations. You can’t have every commissioner calling the lawyer whenever they want and expect not to have to pay for it. Coffey and County Commission got the City of Bunnell involved and in lawsuits over that shameful purchase of a decrepit Plantation utility…where the only one benefitted was Mori Hosseini. Why Is Bunnell facing a lawsuit from Waste Pro? Don’t anyone think about the implications of their decisions, before a go ahead? What have they done with those Palm Terrace water issues? a bunch of professional hours wasted in the tug of war between the new wave and the old timer commissioners. Seems to me that is more important the Me, Me, Me than the common sense ruling to avoid the waste of hard earned tax payers funds. Well, at least there is one good thing about it and is that the Bunnell tax payers now come about to learn that their commissioners have irresponsibly made decisions that come with a high legal tagg attached. As far as I know thru 21 years in Flagler County I consider Attorneys Sid Nowell and Lonni Groot very fine lawyers. I think something else is wrong in that city government not the attorneys. Is going to be a hard task to find a lawyer to suit and serve such a disparity in that commission. IMO, Commissioner Brady is quick to judge and prone to speaking before thinking. This entire commission is prone to bickering to the point that they are no longer effective. New city manager coming on, now a new attorney must be hired. Maybe it’s time for a new commission. It’s a sad thing when the people of Bunnell and Palm Coast feel they have to question in whose interests their own local governments are working. Sounds like his firm saw the circus for what it is and decided it wasn’t worth it. I don’t blame him one bit. To all those workers out there… Happy Labor Day! Hopefully better times are ahead for all! But seriously, well, I mean, uh, can’t we all just, like, uh, get along? I personally see the tide changing. I see that previously embedded council, now having been ripped asunder, trying to survive. I see a future for the city of Bunnell. Simply find an attorney that is willing to ‘stay the course’ and continue on with business. Bunnell, as a city/community, deserves so much more than what is happening at the moment. I want to see intelligent people get together and WORK together! Can that be asking too much? Come on! Typical Crain-Brady mouth is in gear before the brain is engaged. She is the most unprofessional person on that council. Remember what Shakespeare advised the first thing to do with attorneys…. Bunnell is advertising for an $80,000 City Manager? They can have Landon. He needs a pay cut. My mother used to say: If you can’t stand the heat, stay out of the kitchen. This should be interesting to see who wants to stay in the running for City Manager considering this volatile situation and mediocre pay. Good luck with that! The problem is no Attorney really wants to deal with the good old boy politics that still exist in the city. Palm Coast, Bunnell, Flagler Beach, Flagler County, and a Sheriffs Office that all seem to be going to Hell in a Handbasket…. Where does the madness end? Please leave the sheriff out of this issue as so far he is doing a good job! My opinion on any local government entity is paid for with my taxes. I am free to speak my opinion just as you are or anyone else here is. I pay close attention to what’s going on in our county/community..do you? What can you tell me about the current crime rate? The current crime rate is not worse than is was with the current Sheriff predecessor and we now finally see our deputies patrolling our neighborhoods and waterways, again . Besides the fact that now, when we call 911 we get a rapid and effective response comparison with before 2013. I believe that now finally my taxes are properly invested in our current Sheriff Department for the services we receive. Rest assure that I pay good attention about what takes place around this county. Furthermore our current Sheriff unlike his predecessor works and communicates very well with our City of Palm Coast Officials.